For many Texans, the name David Wade brings to mind a gentle and convivial, deep-voiced TV cooking show host who, for decades, shared his love of food with a legion of faithful fans. Dallas was Wade’s home base — it was where he lived, where he established his business empire, and, for the most part, where he recorded his television programs. He seemed like the kind of guy who had it all. But many of his fans would be shocked to learn that David Wade’s most searing childhood memory was the impossible-to-forget day his father killed his mother. In 1929 Eugene and Ora Lee Wade lived in Cameron, Texas, about 50 miles south of Waco. They had four daughters, ranging in age from twelve to twenty-one, and one son, five-year old David. Eugene worked as an engineer at the local cotton gin, and Ora Lee raised the children and was a popular and active member of her church. On the afternoon of Sept. 30, 1929, Eugene came home drunk. Very drunk. He began to argue with Ora Lee, and, as things escalated, she ran to the nearby house of her brother. An angry Eugene lurched after her. A gun was drawn, and Eugene drunkenly threatened his wife with it. In an ensuing physical altercation, the gun went off. Mrs. Wade had been shot in the thigh. She attempted to run away but collapsed after only a few steps. She died soon after being rushed to the hospital — her femoral artery had been severed, and she bled to death. Before the police arrived, Eugene Wade had slashed his throat with a razor, and though not initially expected to live, he survived and was charged with the murder of his wife. The horrible, violent, bloody scene had been witnessed by at least one daughter (and, in all likelihood, probably by five-year old David as well). A distraught Eugene Wade pleaded guilty, was sentenced to life in prison, and by the end of the year, he was on his way to Huntsville. Before he left Cameron, he gave a lengthy, sincere, and heartbreaking interview to The Cameron Herald. In it, he expressed his sorrow, his regret, and his love for his wife and children. Five-year old David had been left, basically, an orphan. He spent some time at the Juliette Fowler home for orphans in Dallas and was later moved around between family members and foster families. He went to Waco High School where he was a popular student (the yearbook photo above was accompanied by the motto supplied by the Senior Band, of which he was a member: “And he is oft the wisest man”), and he received arts degrees from Baylor and the University of Texas (he studied music and had a short career as a singer). He seems to have done well in school, despite the terrible incident in his past. But after college he spent time in California as a “test pilot,” a nerve-wracking job that apparently stressed him out so much that he sought medical treatment (an amateur psychologist might assume that his anxiety was triggered by post-traumatic stress). According to later newspaper profiles, instead of sedatives, the doctors suggested he focus on an enjoyable hobby to settle his nerves. A hobby like cooking. …And the rest is history. When I was growing up and would frequently come across one of David Wade’s shows on TV, I usually clicked on past it unless there was absolutely nothing else to watch. He and the show felt a little corny and were a little too laid back for my taste. Now, though, having learned about his past — and having always felt that Mr. Wade seemed to be a genuinely nice person — I definitely have a more positive and respectful opinion of the man. Ascot, crest-emblazoned blazer, and all. Top photo of a 17-year-old David Lloyd Wade from the 1941 Waco High School yearbook. The coverage of Ora Lee Wade’s funeral in the Cameron Herald (Oct. 3, 1919) — which includes quite a bit of genealogical information — can be found here (click for larger image). The full “jailhouse interview” with Eugene Wade in the Cameron Herald (Dec. 19, 1929) is available in a PDF, here. Incidentally, Eugene Wade’s “life sentence” lasted four years. He was the recipient of one of Governor Ma Ferguson’s notorious “conditional pardons.” He appears to have lived around the Cameron area until his death in 1967. I don’t know whether he ever re-established relationships with his children. A nice overview of David Wade’s very successful career can be found in an article from the April 25, 1976 issue of the Fort Worth Star-Telegram, in a PDF, here. My previous post, “David Wade, Gourmet: Have Ascot, Will Travel” — about his happier days as a successful TV personality — can be read here. 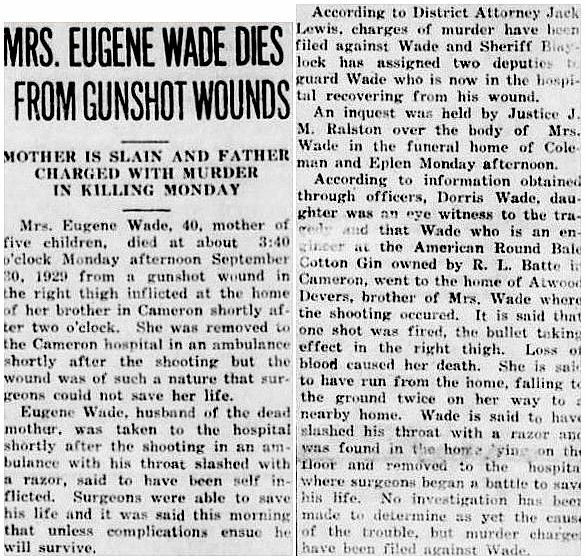 Looks like Eugene was living in Waco on S. 5th St. when he died at age 81 of cerebral thrombosis, 5/21/67. David was the informant on the death certificate and Eugene is interred at Oakwood, there in Waco. Thanks. I wonder what David and Eugene’s relationship — if any — was like? He may have just been known to be next of kin. Sad story.